2011 Paul E. Tsongas Award has been awarded by Preservation Massachusetts to Springfield College, Stephen Jablonski Architects, Elmore Design Collaborative, LLC, and Erland Construction for renovation and rehabilitation of Judd Gym/Stitzer YMCA Center at Springfield College, Springfield, Massachusetts. 2009 Honor Award has been awarded by The Connecticut Chapter of the American Society of Landscape Architects for the Institute for Advanced Study, Historic Landscape, History and Assessment Report in Princeton, New Jersey. 2005 Massachusetts Historical Commission Preservation Award has been awarded to The Trustees of Reservations for the restoration of the Evergreen Garden at Naumkeag in Stockbridge, Massachusetts. 2003 Honor Award has been awarded by The Connecticut Chapter of the American Society of Landscape Architects for the Cultural Landscape Report for Franklin D. Roosevelt’s Top Cottage in Hyde Park, New York. 2001 Annual Preservation Award has been awarded by the Newport Historical Society for the Restoration of the Sunken Garden at The Elms in Newport, Rhode Island. 2001 Historic Preservation Project Award has been awarded by the Rhode Island Historical Preservation and Heritage Commission for the Restoration of the Sunken Garden at The Elms in Newport, Rhode Island. 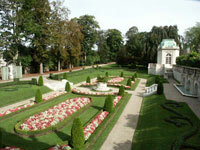 The Sunken Garden at The Elms was restored for the centennial celebration of the house and garden in the Summer 2001. 1997 Merit Award was awarded by The Connecticut Chapter of The American Society of Landscape Architects for the Beardsley Zoological Gardens, Master Plan in Bridgeport, Connecticut (with Denig Design Associates, LLC). 1997 Merit Award was awarded by The Connecticut Chapter of The American Society of Landscape Architects for the Historic Municipal Parks Survey (across the State of Connecticut) prepared for the Connecticut Historical Commission as part of their Connecticut Heritage Landscape Project (with TO Design).